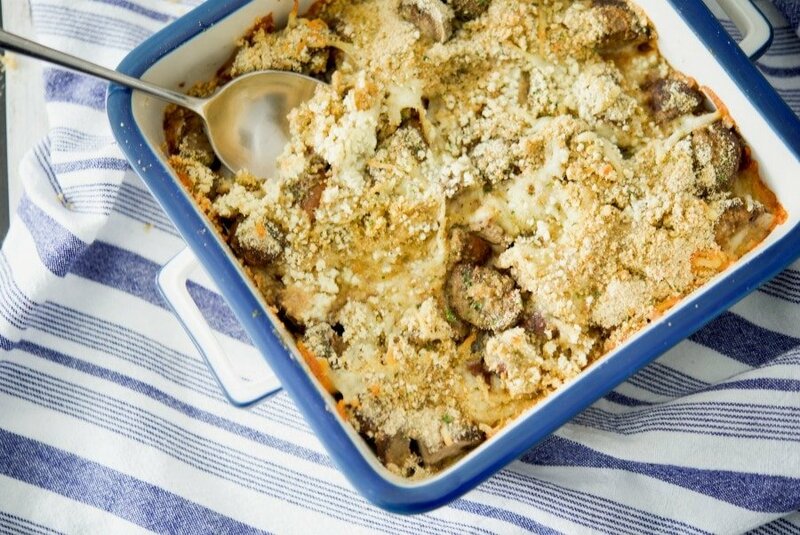 Portobello mushrooms tossed with fresh parsley, garlic and basil; then topped with a Parmesan cheese breadcrumb crust and baked. I have a vintage Italian cookbook that I look through every now and then to find new recipes and came across one for Parmesan Mushrooms. They looked easy enough, but I was hesitant to try them because only my husband and I like mushrooms. Well our oldest daughter likes them too, but she’s away at college so I wanted to only make enough for the two of us to go with our dinner. 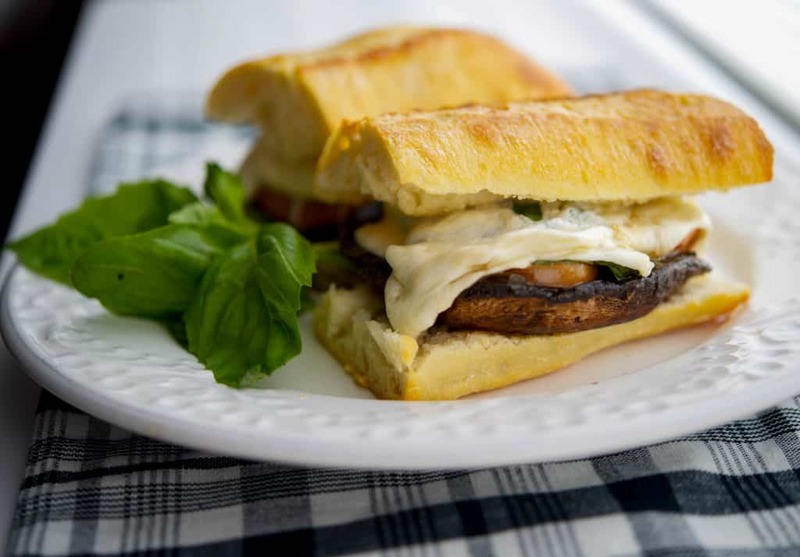 For this recipe, I opted to used baby portobello mushrooms, but you can use your favorite variety. You’ll also need parsley, garlic, basil, Italian breadcrumbs, grated Parmesan cheese, shredded Mozzarella cheese and Extra Virgin Olive Oil. I always have fresh herbs in the house as I prefer them to dried, but if you don’t have them, you could also use the dried herbs or Italian seasoning combination in it’s place. Start by brushing EVOO on the bottom and sides of a 2 quart baking dish. 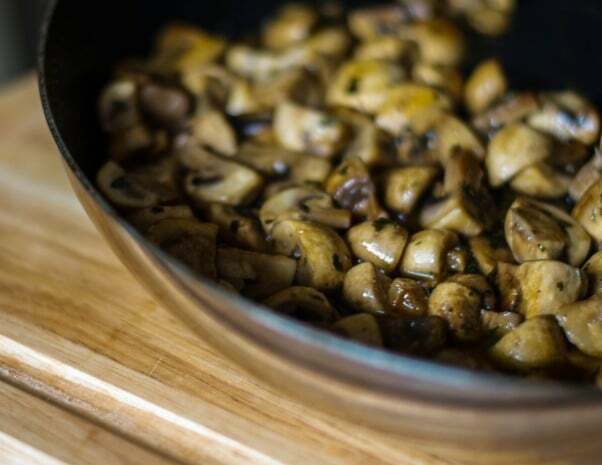 Wash your mushrooms off with a damp cloth; then cut them in half (or in quarters if they’re large) and place them in the baking dish. Next, sprinkle some chopped parsley, garlic and basil on top of the mushrooms; then add 1/4 cup of water. 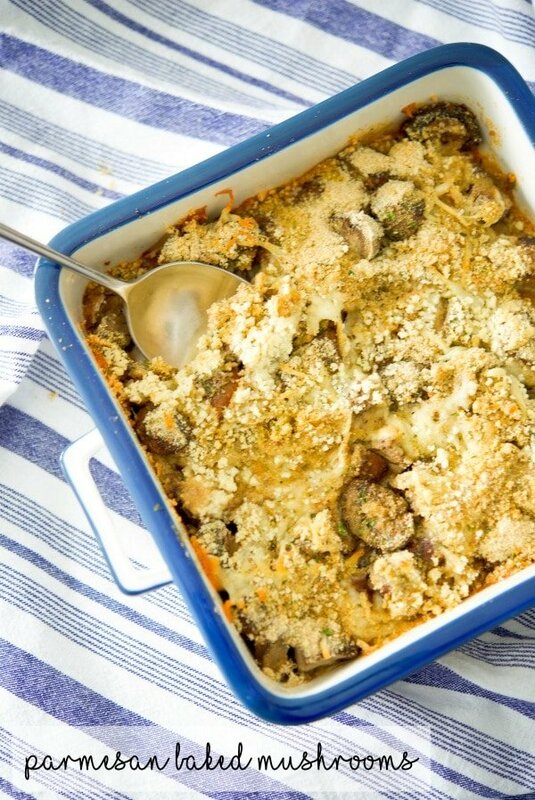 In a small bowl, combine the breadcrumbs, Parmesan and Mozzarella cheese; then sprinkle it on top of the mushrooms. Drizzle some EVOO on top; then bake for 30 minutes until the mushrooms have softened and the breadcrumbs are light brown. 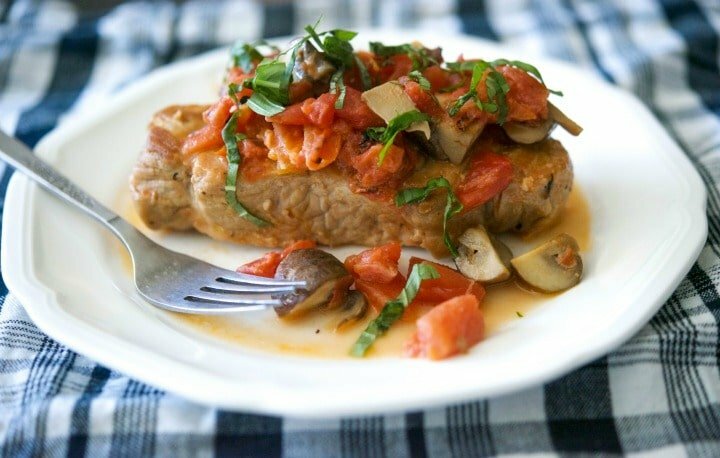 My husband and I really liked these Parmesan Baked Mushrooms and went perfectly with those Italian Breaded Pork Chops I posted the other day. ~Enjoy! Brush 1 tbsp. of oil on the bottom and sides of a small baking dish (mine was 8x8x2). Wash your mushrooms off with a damp cloth; then cut them in half (or in quarters if they're large) and place them in the baking dish. Next, sprinkle parsley, garlic and basil on top of the mushrooms; then the water. 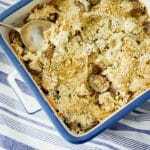 In a small bowl, combine the breadcrumbs, Parmesan and Mozzarella cheese; then sprinkle it on top of the mushrooms. Drizzle the remaining oil on top of the breadcrumb mixture; then bake for 30 minutes or until the mushrooms have softened and the breadcrumbs are light brown. *You can substitute 2 tsp. of dried Italian seasoning in place of the fresh parsley and basil. Here are some more recipes you might like!